Waves do not spread in a disordered medium if there is less than one wavelength between two defects. Physicists from the universities of Zurich and Constance have now proved Nobel Prize winner Philip W. Anderson's theory directly for the first time using the diffusion of light in a cloudy medium. Light cannot spread in a straight line in a cloudy medium like milk because the many droplets of fat divert the light as defects. If the disorder – the concentration of defects – exceeds a certain level, the waves are no longer able to spread in a cloudy medium at all. Philip. W. Anderson was the first to describe this transition to a localized wave in 1958, which is why it is also referred to as Anderson localization. Until now, however, Anderson localization had never been observed. For the first time, physicists from the universities of Zurich and Constance have now demonstrated the Anderson localization of light directly in an experiment. As their article published in the science journal Nature Photonics reveals, the Anderson localization of light only occurs in much cloudier media than milk – in other words, only if there is only about one wavelength between two defects. For their study, the team examined the diffusion of light in a very strongly scattering medium. "In order to make the diffusion of the light and thus Anderson localization visible, pictures had to be taken at an interval of less than a billionth of a second," says Christof Aegerter, explaining the technical challenges of the project. 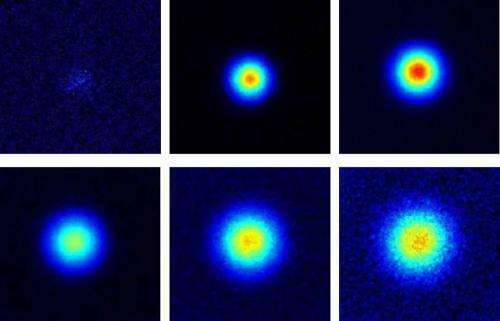 Based on these high-resolution images, the researchers were able to show that in the case of Anderson localization light is no longer able to spread any further in the medium after around four billionths of a second (or nanoseconds). Until now, it was very difficult to calculate certain characteristics of localized states, such as how large the critical concentration of the defects is. "Thanks to our experimental data, the theory will gain new impetus and be able to be refined further," Aegerter is convinced. The Anderson localization of waves is a general phenomenon that occurs in all waves with a heavy scattering and is also of practical importance: It describes, among other things, the transition between a conductor and an isolator. In less dispersive medium the light indeed will not stop, but we can still observe it as so-called autofocusation of laser beams. It can be observed for intensive, but very short pulses of light. The general principle is, the refraction index of environment increases with intensity of light nonlinearly, when higher harmonic frequencies are generated. In such case the beam is behaving like the rod of more dense environment and it has a tendency to focus the light toward axis of beam into even more dense beam in avalanche-like mechanism, until it will close the light wave inside of spherical lens of plasma.